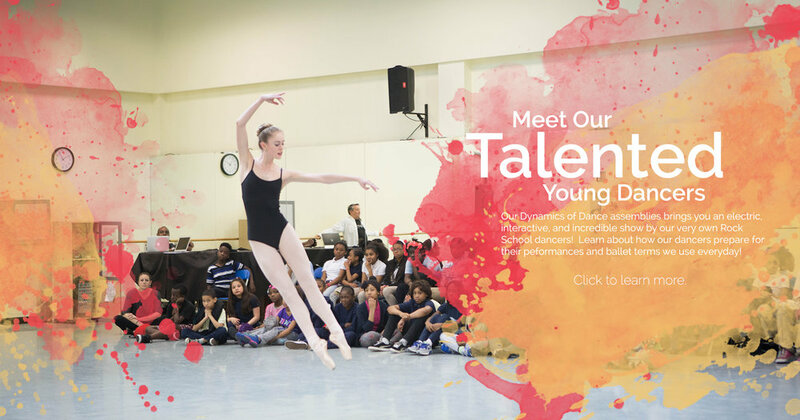 The Rock School's multi-faceted outreach program, RockReach is the most extensive dance and movement community outreach program in the Philadelphia region. Today, the program touches the lives of over 26,000 inner-city children annually through multiple components: in-school and after-school Residencies, which include 36 weeks of high-quality, twice-weekly dance instruction integrated into each participating school's curriculum; Dynamics of Dance, school-wide interactive, energetic performances by Rock School students; City Dance, a long-term scholarship program for students of low-income families; and free tickets and transportation for 1,800 RockReach students to The Rock School's holiday production of Nutcracker 1776 at the Merriam Theater. Sign up with your email address to stay up to date with the latest news and events! We are so proud of all the RockReach dancers who were accepted as a dance major into the Philadelphia High School for The Creative and Performing Arts. Class of 2023! Congratulations! 🙌 We are thrilled to have been part of the process of helping these talented artists flourish. Featured School: Mastery Charter School - Check out what RockReach Teaching Artist, Charon Mapp has to say about her fabulous students at Mastery Charter School! RockReach Teaching Artist teaches Jazz at Shepard Recreation Center and inspires children in our community through dance. PHILLY CELEBRATES JAZZ Jazz class at Mt. Airy Playground featuring #RockReach Teaching Artist, Fallon Gannon was a success! These cuties (ages 4-11) joined us and had a wonderful time. Thank you Fallon helping make dance more accessible in our communities! Meet our Student of the Month: Tasheen from Overbrook Educational Center! RockReach's TEACHER OF THE MONTH goes to.. *drum rolls* Theresa Pelicata! Click to read more! This past Friday, our Rockreach students at Overbrook Educational Center received ballet shoes for their class. RockReach Welcomes KIPP West Philadelphia! RockReach would like to welcome a new school into our RockReach family, KIPP West Philadelphia Preparatory Charter School! It was such a pleasure to watch my middle schoolers interact with each other through dance. They made friendships that maybe they would not have if it weren't for finding their common shared interests in music and dance. They also had so much fun practicing new moves until getting it "right." Every week, I saw students supporting each other, cheering each other on, and even breaking into spontaneous dances during warm-ups! It was so inspiring to me and also just pure, innocent, fun. In particular, there was one student who has always been on the quieter side, but who completely left his comfort zone by choosing to perform his own original hip-hop dance in our talent show. He did an amazing job and received the loudest applause when he was done. It is something I will never forget, nor will he, and he was beaming with confidence and pride as he exited the stage. It was without a doubt one of the best experiences I've had as a teacher! This year, the DEA Youth Dance Program had the great pleasure of working with the Rock School of Dance Education's in school outreach program - Rockreach. Rockreach is a dynamic, multifaceted community outreach program that makes dance accessible to over 26,000 underserved youth of Philadelphia each year. Rockreach joined the DEA YDP team as our Philadelphia based performance company and provides dynamic teachers for us in our schools. Outreach director Christina Pastras, and Community Relations Director Susan Rock are their highly professional team working behind the scenes to make the DEA Youth Dance Program function seamlessly here in Philadelphia. They take the approach of - Nothing is impossible and everything is doable - when it comes to the DEA Youth Dance Program and we are so grateful for that! It is with great enthusiasm that I look over the time that my students had with Rock Reach. The most memorable moment was a student the had autism and the affects it had on him. Rock Reach gave him something to look forward to. Rock Reach provided movement needed in his day. Rock Reach became his incentive. He was a different child when in the Rock Reach program and has shaped the child he has grown to be. I also need to make mention of the flexibility and support of Ms. Kelly, Wister's assigned teacher. She was excellent with the students and with changes in the teachers' schedules. We are appreciative of everything she has done for our students. RockReach is an outstanding program that my DreamKids look forward to being a part of every Friday! We can't imagine a successful year without Rock Reach being in our daily programming. We are appreciative of the creative expression Rock Reach provides for DreamKids. Thank you! Gesu has been fortunate to have the RockReach Program for many years. Children have the opportunity to learn a variety of dances. It has enabled our children to not only grow more graceful and coordinated physically, it has greatly increased the self confidence of each child. Rock Reach has enriched the lives of our students by broadening their knowledge of music, dance and art. The children love our Rock Reach classes. Having the Rock Reach Dance program at Nebinger is an invaluable and enriching experience for our students. Over the past two years that I have been involved with Rock Reach, I have seen tremendous growth in our students' skills and in their own personal growth. Every year they are excited to see the Nutcracker, travel to the Rock School, and of course, to put on their own performance. The program gives the students a chance to see each other succeed and to support one another outside of the academic realm, and that is so important for our kids to develop social skills to help ensure their full development. I just want to point out how committed RockReach Dance School has been to my school, Hardy Williams. We are going into our third year and the students can not wait until the year starts again. The instructor is awesome and you can tell she also enjoys working with the students. I'm looking forward to another GREAT year. With no gym, music or art the Rock dance program has brought joy and skill to 4th and 5th grade students in our title one school. The rock dance program has provided consistency, discipline and a skill set that these children would never be exposed to otherwise. We are very hopeful to work with the rock program again for the upcoming school year.